near Redding are featured on this page. 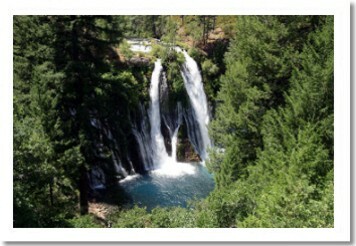 Burney Falls -- Mossbrae Falls -- Whiskeytown Falls -- McCloud Falls -- Hedge Creek Falls. 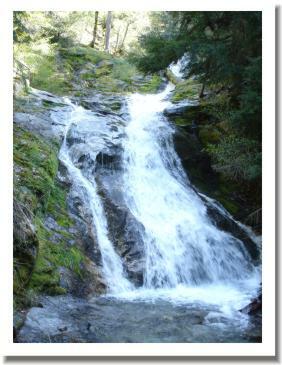 This set of falls is about an hour from Redding east on Hwy 299. Former President Teddy Roosevelt considered the falls as the as the 8th wonder of the world. 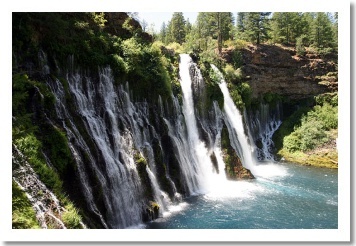 Burney Falls located in McArthur Burney Falls State Park is not the highest nor largest waterfall in the state, but many people consider it the most beautiful. Unlike other waterfalls here or elsewhere, it continues to flow at the same rate all year long: about 100 million gallons every day. 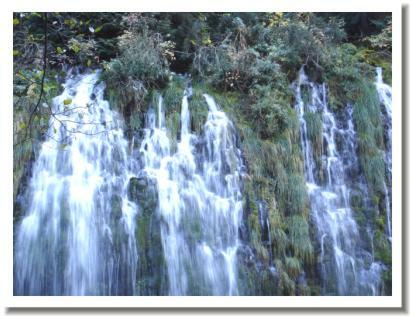 The strikingly clear, pure water flows from openings in the volcanic rock at and above the falls. The water temperature, even on hot summer days, is about 42 degrees Fahrenheit. The 129-foot-high waterfall cascades into an almost iridescent pool underneath. Light penetrates deep into the clear water, reflecting a cool blue color. 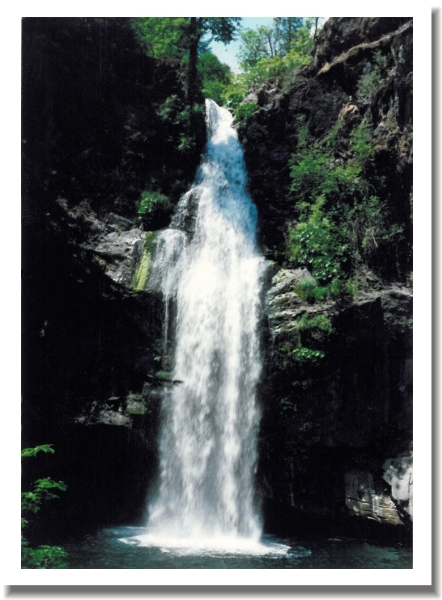 The strikingly clear, pure water comes from openings in the volcanic rock at and above the falls. At the foot of the falls it is like a rain forest: cool and laced with mist. A trail leads from the foot of the falls down to Lake Britton, where there is a boat ramp and a swimming beach. Interested in this area? Contact Eric Lewis (530-227-7722) for Redding Real Estate for sale. 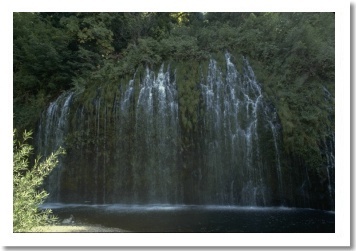 Thanks to my daughter Ashley Lewis for the Mossbrae Falls pictures. 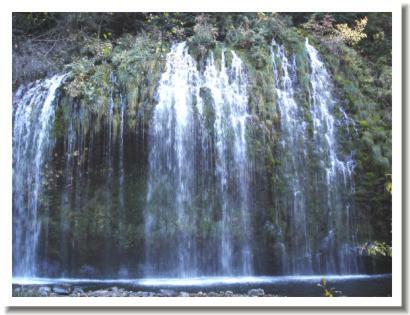 Mossbrae Falls is a beautiful waterfall cascading over a hillside of brilliant green foliage into the pristine Sacramento River. Just a short walk from the neighborhoods of Dunsmuir, Mossbrae Falls is a must see for visitors to the beautiful Dunsmuir river canyon. 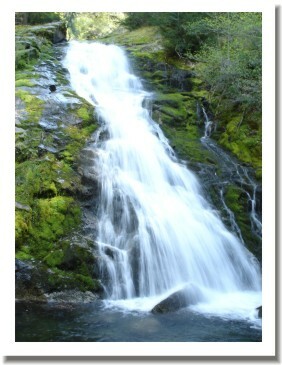 Just west of Redding California sits Whiskeytown falls. 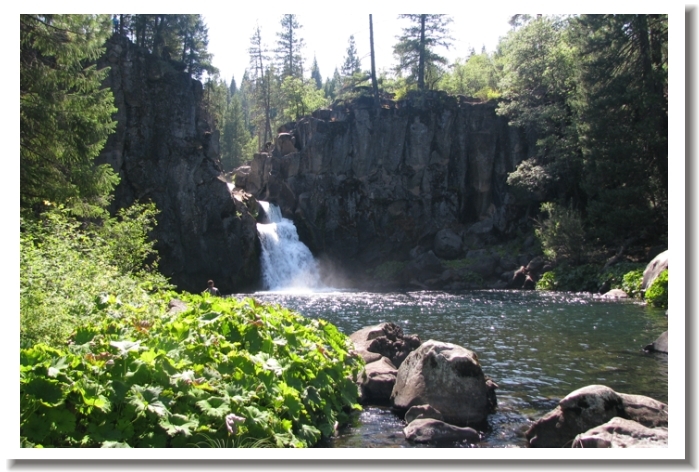 Located within the boundaries of Whiskeytown National Park. 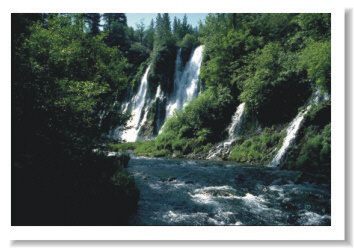 These falls were discovered or rediscovered in 2005 and a trail was built for the public to access them. The hike is 1.7 miles each way and you'll be in a steady and sometimes steep climb to reach your destination. An interesting feature of these falls is they curve as they traverse the slope, a bit like a portion of a circular staircase. Because of this, getting a picture of the entire falls I'll leave up to a professional rock climber who happens to be a photographer as well. More on Whiskeytown Lake. A "steady climb" for a middle aged overweight guy like me means I think I about died (ha-ha). Once arriving at the falls, it was well worth the effort and next time I think I'll take a little rest on the way up. On the way back down to the parking area it was very easy and took less than half of the time as going up. You can learn more about these falls by visiting the National Park Service web site regarding the falls of Whiskeytown, or another portion of the Park service site is dedicated to Whiskeytown National Park, you can also see larger pictures of Whiskeytown Falls on this site if you prefer. 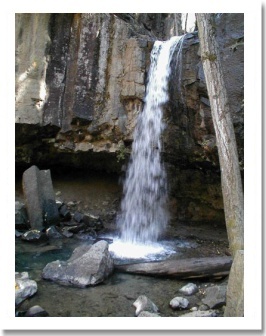 Potem Falls is located just out of Round Mountian off Fenders Ferry Road about 30 minutes North-East of Redding. 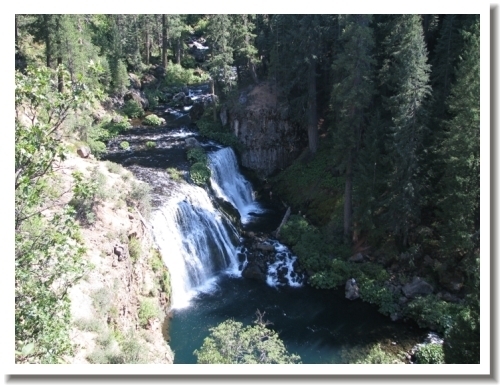 Potem Creek becomes a part of the Pit River Arm of Shasta Lake soon after the falls. I took this photo back in the 1980's while camping in the area. 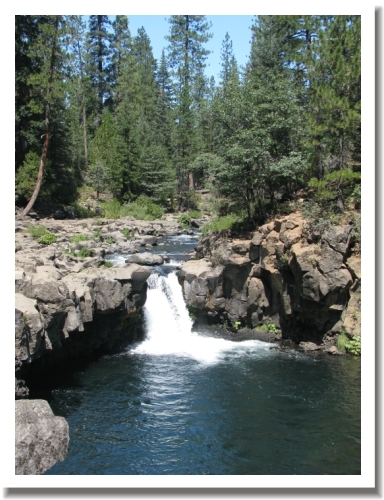 As a family for 25 straight years we went to Madrone Campground, the nearby campground lies along Squaw Creek which also has a waterfall nearby. 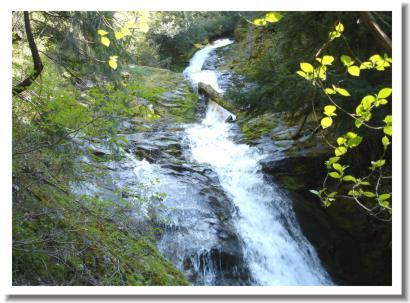 Slightly to the north of Dunsmuir and a five minute walk from the road, you'll arrive at beautiful Hedgecreek Falls. 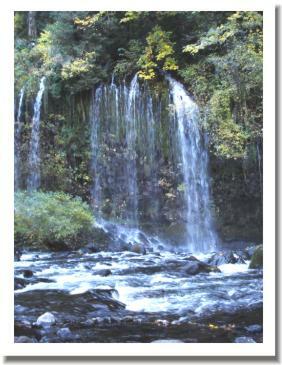 Sit on the bench while the kids run around behind the falls or frolic in the cool, clean waters. You can enjoy the picnic area at the top of the falls also. Mt. Shasta - City Pictures - Mt. Lassen - Shasta Lake - Whiskeytown Lake - Castle Crags - or, View all Homes and land for sale in the Redding Area. Copyright 2013 Eric Lewis. All rights reserved.